Meteos: Disney Magic is set up to take a little longer to download than the original, Meteos, but with Meteos: Disney Magic, you can switch between single-player demo and multi-player vs without needing to shut down and re-download. Here, you can dodge back and forth quickly between the two and a broken wireless connection, even is vs play, does not require anyone to power down - just return to the main menu. You can't play demo-vs-demo in Meteos: Disney Magic, but as long as you're not trying to host any tournaments, it's much more efficient. The menus in Meteos: Disney Magic are a bit of a mixed bag: there are some good aspects and some bad aspects. The good is that "DS Download Play" is right on the main menu and, when you click on it, the game automatically begins seeking out those who wish to download. Unfortunately, after the download process is complete, it doesn't explain that you then have to go to the "Multi-Player" option to continue. The other bit of bad is how small the fields are. Some of the options and arrows are so small, they're difficult to tap accurately without tapping on a different field. The responsiveness of the touch screen in Meteos: Disney Magic is excellent. Blocks move when they're supposed to and go where they're supposed to (assuming your aim is good). Just like in the original Meteos, gravity (or whatever the new equivalent is) varies from one Story Book to another, as does the success rate achieved by a horizontal vs vertical chain of 3-or-more-in-a-row and the number of different color/picture variations. Gameplay is also easier in Meteos: Disney Magic because you can now move blocks vertically or horizontally (in Meteos, blocks could only be moved vertically). In addition to that, it seemed like having a screen that is taller (rather than wider) made it take longer for the screen to fill. One major issue does stand out that might be a problem for some people: the fact that the game has you holding the Nintendo DS like a book works really great for the host, but the host had better hope all of their friends are right-handed since the game does not allow a left-handed demo option. Meteos: Disney Magic has a great look that ties in with it's associated Disney characters in every appropriate way possible. The individual blocks are themed, the backgrounds fit, and the animations and artwork on the non-touch screen were nicely designed (though not an interactive part of the gameplay). The only graphical "issue" is the teeny, tiny, itty-bitty, little icons that represent which Story Book the host is selecting to play in (if it weren't for the labels, it'd be nightmare trying to figure out which level you were selecting, since they all look the same). The music is nice, but it isn't the main musical themes that fans of the movies are familiar with. The sound effects achieved from launching blocks also don't "mingle" with the music as well as in the original Meteos game. There's a nice set of options available, but there's only one playable Story Book and you can't play demo-vs-demo. Meteos is still one of my favorite Nintendo DS games. The basic gameplay was (and still is) very original, despite being in a sea of ten million copycats. Meteos: Disney Magic continues with the same style of gameplay, but with some changes. The sci-fi elements of interstellar battle and protecting your homeworld from invasion are gone in favor of Disney movies (and TV shows). Despite the changes, the basic gameplay survived intact. 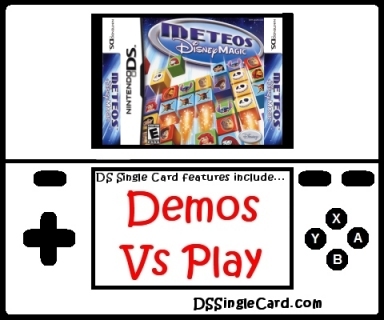 All I review here at DSSingleCard.com is the Single-Card Download functions of Nintendo DS games, and the scores here never reflect on the single-player aspects of the game, even if they're discussed. Sometimes, though, I feel that it could be helpful to pass on some information. There are a few general differences that came about between Meteos and Meteos: Disney Magic which might assist someone who wants to buy one or the other, so I thought I'd compare a few of them. One of the changes is the simplification of the gameplay in Meteos: Disney Magic (the addition of horizontal movement): if you want simple, get Meteos: Disney Magic, and if you want a challenge, get Meteos. Another difference is in theme: if you want sci-fi, get Meteos, and if you want Disney, get Meteos: Disney Magic. Finally, if you want a game where you can unlock all of the key features quickly, pick up Meteos: Disney Magic, and if you want a game where you can spend a lot of time earning more than double the unlockables, get Meteos. If you're like me and you try one and love it, you'll end up with both anyway. I enjoyed Meteos: Disney Magic - not quite as much as Meteos, but very few games hit the high of an addiction level with me. I like the horizontal screen and the horizontal movement is nice (which purists can, of course, choose not to utilize - it's not forced on you). The original Meteos had me coming back much more often in order to unlock an unbelievably large number of unlockables. With Meteos: Disney Magic, I was able to unlock the important aspect (every Story Book) in a matter of hours. On one hand it was to get at everything so quickly, while on the other hand there wasn't nearly as much to get at (Meteos has 32 worlds while Meteos: Disney Magic has only 17 Story Books). Disney has such a large catalog of material they can draw from that even though Meteos: Disney Magic is a great game, it feels a little empty considering how much wasn't there. Include twice as many Story Books. Offer a left-handed option for the Single-Card Download features. Allow for one-on-one demo-vs-demo battles. Program the ability to select one of several Story Books to send along with the Single-Card Download play. Click here to return to the DSSingleCard.com Meteos: Disney Magic profile.